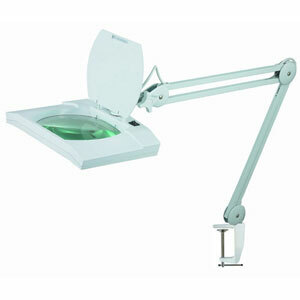 Buy Magnifier Light - LED magnifying lamp, 108 lights, 5 dioptre. Suited for use in various professions such as Magnifier Lights, Electronics and Medical. Also used by hobbyists and those with reduced sight. Price: $235.00 incl GST Sorry item out of stock. CAPG008W. Salon Beauty Lamp used for facial treatments. Courier delivery for Magnifying Lamps within Australia. Payments taken online for MasterCard, Visa or PayPal. Call us for more details on (02) 6162 1950 or email us. * We have Magnifiers that sit on a Desk, Stand alone or Table Clamp models. * A full range of Magnifying Light models can be demonstrated at our store in Canberra.